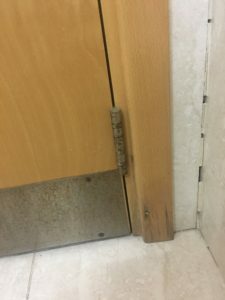 How cleaning companies destroy public toilets using chemicals is a common site in Dubai’s Public Buildings. Facilities Managers in Dubai need be vigilant. Cleaners of traditional cleaning companies are not properly trained. They are not sensitive to the adverse corrosive effects of harsh chemicals on stainless steel and chrome plated fittings and fixture. They are not trained how to clean grouts, They will just splash the grouting chemicals mixed water on the floor and start scrubbing. Besides splashes on the chrome plated protective sheets on the door and door hinges, as is apparent in the picture below, it is important to know that even the fumes of these chemicals when settled can corrode the metallic parts. It is more so in the High-Rise Public Buildings that are closed and not properly ventilated. 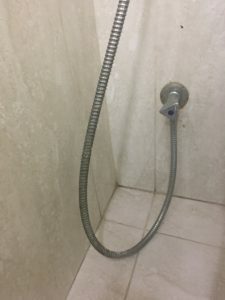 Another common mistake that cleaners make is using the used dusters on chrome fixtures after using to wipe off other surfaces cleaned with chemicals. This leaves the chemical residues on the shiny metal objects and corrode them or discolor them. How cleaning companies destroy public toilets using chemicals : A Case for Steam Cleaning! Mangrove Services LLC has observed in many places how Cleaning Companies Destroy Public Toilets using Chemicals as Facilities Managers have called us on numerous occasions to see if we could help them. While we educate them as to why this has happened, we can help them only to a certain extent. If it is discoloration on Stainless steel fixtures, there is possibility of some improvement. However, if it is the chrome plating that has corroded, there is hardly anything that any cleaning company can do. This leads us to the famous quote “Prevention is better than the cure”. Steam Cleaning as an alternative to Chemical based cleaning serves both purposes that FM Managers in any Public Building want to achieve – Cleaning & Disinfection or Sanitization. Steam Cleaning not only cleans deeper than Mop & Bucket based cleaning but it also kills 99.9% bacteria and other microbes without using harmful chemicals.